"I'm Rupert Murdoch, the billionaire tyrant!" —Rupert Murdoch, The Simpsons, "Sunday, Cruddy Sunday"note Note that The Simpsons airs on Fox—which is owned by Murdoch. Australian-born American man with an American media company that controls much of the UK. Keith Rupert Murdoch (born 11 March 1931), Rupert to his friends and confidantes, "Murdoch" to his editors, and "The dirty Digger" to Private Eye, is one of the most powerful men in the world media. He controls News Corporation and Fox Corporation, which combined owns a dizzying number of newspapers, channels including the Fox and MyNetworkTV networks as well the Fox station group (comprising 29 stations; 18 are Fox and 11 are MyNetwork TV), the most network-owned stations of the six major networks in the US. He also owns half of a cable television provider, radio stations, book publishers, magazines and recording studios internationally. From 1984 to 2017, he famously owned 20th Century Fox as well, and at one point even owned half of Australia's National Rugby League. Historically, it's been possible to tell who is going to win an election in Britain based solely on whom Murdoch is supporting at the time, since he controls The Sun and The Times. His influence has been so great that after an unexpected win for the Conservatives in the 1992 election the Sun triumphantly announced 'It's the Sun wot won it', and the triumphant Conservatives practically acknowledged as much. Potential prime ministers get one meeting a year to wow Murdoch into supporting them. However, his cosy position of influence has been on the decline after several years of allegations that the News of the World hacked into the phones of several celebrities and famous people, which has now extended to include hacking the phones of the families of dead soldiers and 7/7 victims and deleting messages on the phone of a murdered girl, Millie Dowler, to listen in on more. In the latter case, the deleting of messages briefly made her parents and investigators believe that she was still alive. Shortly afterwards, Murdoch's son announced that the paper was being shut down due to the resultant tide of outrage - the British public are prepared to put up with a lot, but some the hacking didn't so much cross the line as hop back and forth over it, cackling maniacally. However, another Murdoch rag, the Sun on Sunday, quickly popped up to replace it, despite being at least as explicit in its hacking activities as the News of the World. Despite this, the scandal has spread to other News International titles and also abroad, with his US companies also being investigated as a result (However thanks to his almost total ownership of the British media, the reporting on the phone hacking scandal has perhaps not been as revealing and scandalous as it should have been). 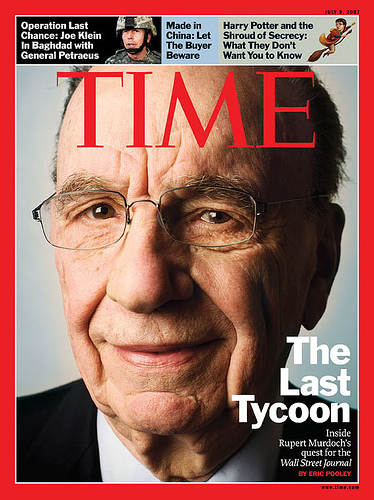 Consequently, Murdoch's influence has waned significantly in the aftermath of these revelations. That is to say, it's still there, it just isn't anywhere near what it used to be, and his support is no longer a guarantee of electoral victory that it used to be. The final nail in the coffin came when the Parliamentary Select Committee on Culture, Media and Sport published a report on May 1st, declaring "that Rupert Murdoch is not a fit person to exercise the stewardship of a major international company" and broadcasting regulator Ofcom looking into whether Sky, the satellite television company, could have retained its broadcasting licence while News Corp still owned 39% of its shares . In June 2012, Murdoch confirmed that News Corp. would be split into two public companies, focusing on publishing and entertainment. Initially, the entertainment side was to be known as the Fox Group, but it was announced in April 2013 that the new company would be known as 21st Century Fox to reflect the heritage and legacy of the 20th Century Fox brand (and admit it, we're just 9 away from 30th Century Fox). This transaction was arranged so that the publishing assets (and the Australian cable assets) would be split to form a new News Corp., and the old News Corp. would become 21st Century Fox. The transaction closed June 28, 2013. The motion picture studio itself continued as 20th Century Fox. Then, on December 14, 2017, in a move that shook the entire media world, Disney announced that it would acquire most of 21st Century Fox's entertainment assets, including 20th Century Fox, the FX Networks, Fox International Channels, the Fox Sports regional networks (which Disney agreed to then sell off to third parties in order to get the transaction approved by the US government), Star India and Fox's stakes in National Geographic Partners, Endemol Shine Group and Hulu for a reported $73.1 billion, effectively collapsing Rupert Murdoch's media empire and solidifying Disney's status as the largest media conglomerate in the world. Fox's stake in the Sky group was originally part of the deal, but Comcast decided to bid for the satellite provider, triggering an auction in which Comcast ended up with the higher bid to buy out both Fox and Sky's independent shareholders. The Murdochs will retain Fox's news, national sports and broadcasting units for a separate entity, Fox Corporation, which could theoretically merge back into News Corp. As part of the deal, the Murdoch family became the largest individual shareholders in Disney. Back at home, Murdoch retains a dominant role in the Australian media, owning newspapers in nearly every major city in the country (with the Fairfax press giving many cities legitimate competition). The Australian, the country's only general-interest national newspaper, is a slightly more respectable version of USA Today. Due to Australian laws, Murdoch cannot own broadcast stations there anymore, but he is a strong player in cable and satellite television, with half of the Foxtel service (essentially Sky under a different name). Similar to the Blair example above, he voiced approval of Kevin Rudd before the man was elected Prime Minister. Despite a landslide victory Rudd was rolled by his own Labor party with surprising speed, and the new Labor regime has been excoriated most ruthlessly in Murdoch's press (whether this is due to partisanship or not is controversial). A few decades earlier, his papers supported Gough Whitlam's Labor prior to the 1972 election, who gained government after 23 years in opposition. He then turned against them, supporting Malcolm Fraser in the election following Whitlam's dismissal by the Governor General, which Fraser won with the largest majority in Australian history. He bought MySpace just as Facebook was on the rise, and sold it off a few years down the line, when it was dead and buried. Parodied in Fierce Creatures, the spiritual sequel of A Fish Called Wanda. Part of the inspiration for Kim Newman's devil character Derek Leech (the other parts being Richard Branson and Satan). Elliot Carver in Tomorrow Never Dies is similar, but actually based on Robert Maxwell. Nicknamed "The Dirty Digger" in Private Eye. A Bit of Fry and Laurie had the angel in its Wonderful Life sketch push him back off the bridge. And Keith Olbermann portrays him as either a pirate or Emperor Palpatine. Arr! When the British TV playwright Dennis Potter was diagnosed with terminal cancer, he named his cancer Rupert after Mr. Murdoch. Long story short, people who love him will say of him, "He's the man!" People who hate him will agree verbatim.